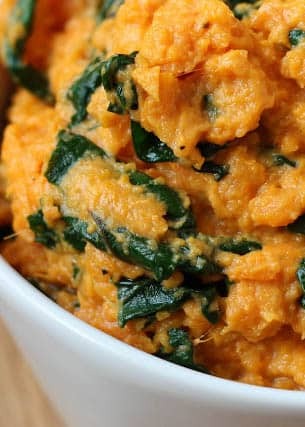 Soft, tender, buttery spinach tossed with hot garlic and then combined with roasted sweet potatoes has become one of my newest favorite side dishes. I’ve made this recipe three times now and I’ve loved it more each time. The original recipe I stumbled upon was for stuffed sweet potatoes, but I had absolutely no luck with stuffing them. The skins were simply too thin or I wasn’t patient enough, whatever the reason, we were not fans of the final results. However, I seriously loved the filling, so I’ve adapted the recipe to make it even simpler than the original. I can’t hide the fact that this is one weird looking dish of potatoes. Even my ever-so-willing-to-try-anything husband did a double take the first time I presented it to him. Thank you to the local Farmer’s Market for the loads of greens constantly in my house these days. I think we are immune to finding greens in random food dishes at this point! Thank heaven for smoothies that use up the bulk of them for my family. Strange looking or not, my family eats this like crazy. My kids are always so unpredictable with spinach. Some recipes they love and others, not so much. This one is a definite keeper for my family. 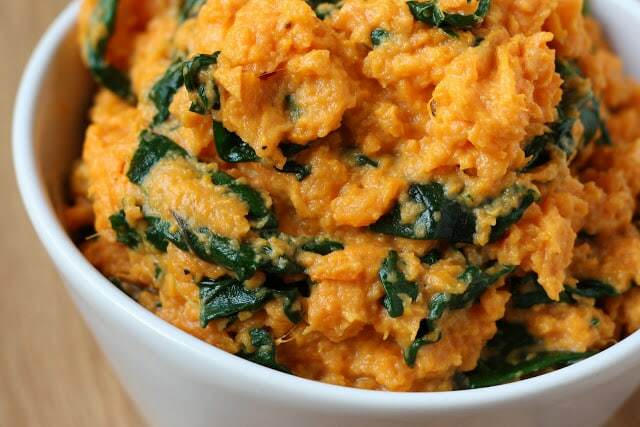 For another healthy way to cook your sweet potatoes, check out this Healthy Sweet Potato Casserole! Preheat oven to 350 degrees. Line a baking sheet with foil and place the scrubbed sweet potatoes on it. Puncture each of them with a fork and then bake until they are fork tender, about 45-60 minutes depending on size. When the potatoes are done, remove from the oven and let cool for a few minutes. Slice them in half and peel the skins off of them. (This is very easy once they are roasted.) Place the cooked potatoes in a large mixing bowl and smash with a potato masher. Add the sour cream, salt and pepper and stir to combine. Taste and adjust seasonings. Set aside. In a large skillet, over medium heat, melt the butter and add the garlic. When the garlic is fragrant, after about a minute, add the spinach. Toss with tongs to coat the leaves thoroughly and continue tossing as the spinach cooks. It should wilt fairly quickly, within a few minutes. You want it to be soft and tender, not crisp for this recipe. I have made this a couple of times already, and I'm making it again tonight. Absolutely love it! Thank you very much for posting it! Oh my goodness!! This is going to be my new go to side dish. 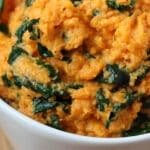 I LOVE that you added spinach to one of my favorite foods EVER!